What the Pella-Inn really cannot be beat on is the view. From the rooftop bar you have a clear sight of the Acropolis, all the better at night when it's lit up majestically. Its central location means it's close to all the key sight-seeing spots; the Ancient Agora, Keramikos, Olympic Stadium and National Archaeological Museum are all just a stone's throw away. But this doesn't mean it caters just to those looking only for culture. The bar is a great place to meet fellow travellers and chill out with your chums over a few ice cold beers. Pella Inn is situated in the heart of the old town of Athens within walking distance from the famous Acropolis, Monastiraki square and Plaka. The rooms and their balconies have a direct view of the Acropolis, as does the rooftop bar, which is perfect for chilling out, having a good time and meeting other travelers while enjoying the amazing view of the Acropolis and the rest of the city. The nearest metro station, Monastiraki, is only 150 meters away providing easy access to and from the airport, as well as a direct line to the port of Piraeus. The excellent location of Pella Inn gives you immediate access to all the interesting sights of Athens such as the Acropolis, the Ancient Agora, Keramikos, the Olympic Stadium, the National Archaeological Museum, etc. Our friendly staff is always prepared to advise you on how to get around the city, from the tourist sites to places 'off the beaten path'. Being situated in the city center, it is an ideal place to set as a base while you explore the heart of Athens. 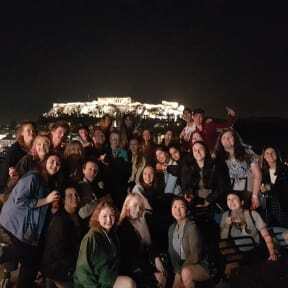 Not to mention the incredible view of the Acropolis from the roof. The staff were friendly and helpful throughout my stay, and the room itself, while moderate in size, was very clean. Couldn't ask for more! Unbeatable location in proximity to ancient Athens! Very accommodating. In a perfect world, people who snore would be given a room with other people who snore, but bring your earplugs if you want a full night's sleep! 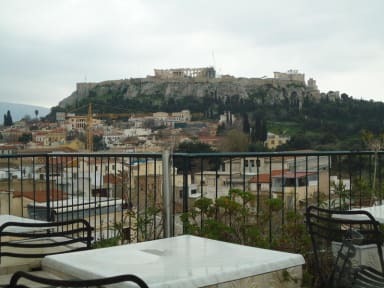 The location of the place is one of the best I can imagine, you can see the Parthenon from the window of your room or from the roof top of the building (open 24 hours), the staff is really kind and they ask if we wanted our room clean (no charges). You feel safe and the atmosphere is quite good too. The worst point is the facilities because for example you dont always have a plug next to your bed, and there are a lot of noise outside but maybe that's the point of Athens, who knows. Good choice! Amazing view. The shower leaked water everywhere. Clean and in a great part of the city. Its right next to the market close to all the historical sites. The staff is great. Besides the bar upstairs, there isnt much to do at the hostel. But the value was great! Overall good. But look, maybe it was the off season. Maybe it was a down weekend. For whatever reason, there were literally five people in the whole hostel for the two nights we were there. Just weird because it was clean and nice and also THIS IS THE BEST LOCATION FOR A HOSTEL. Staff was helpful and friendly. WiFi was spotty at times. But this LOCATION WAS AMAZING. Rooftop was nice and rooms were tidy and comfy. Lockers cost one euro but room locks so felt good about security. The location and rooftop are great. Bed was quite uncomfortable and staff not really interactive. Hostel was clean. The location and value was great. The front desk employee who checked us in, didn't know where our reservation was, which was momentarily frustrating. The room had not been cleaned (there was trash in it) and the bathroom was so small it the shower was literally the entirety of the bathroom, with the toilet and sink in it. There were no comforter covers either. Overall, it was an okay place to stay but not the cleanest. Checking in was smooth and the front desk attendant was super friendly!! Gave great advice on places to visit. But the only problem that I had with this hostel was the smell!! The room was muggy and gross. I get there are multiple people sleeping in there but I’ve never been to a hostel where the blankets smell like body odor!! The bathrooms were TINY and there was only one per dorm of 12 bunk beds. Not impressed. I’m used to community bathrooms but not being limited to one.